Life can be hell, and the sisters know it. 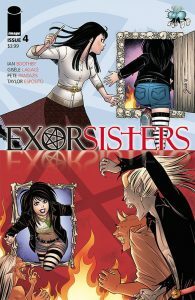 A new issue of Exorsisters is here from Image! Well, this is issue 4 after all, and we know the drill. Two sisters, Cate and Kate are enchanters without souls. Their mother is in league with Satan. It’s the brainchild of writer Ian Boothby and Canadian artist Gisèle Lagacé. 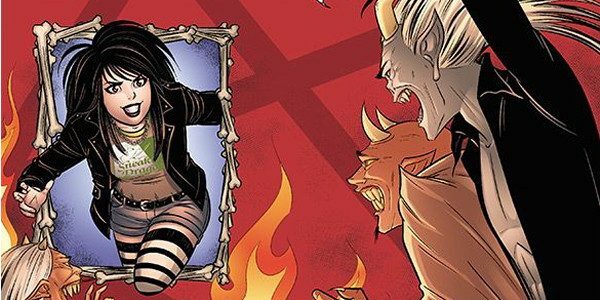 Together with colourist Pete Pantazis, they keep the home fires burning on this semi-serious saga of sorcery and satire. This issue’s variant cover is a nice one, illustrated by Canadian comic veteran Ty Templeton. The image of the two Exorsisters taking a selfie after conquering some bloody minotaur is a classic. Inside, things are just as they are, as the Zen saying goes; another night shift of Exorsistering. But when you rescue someone from Satan, are you really doing what you think you’re doing? And what’s Mom up to, sneaking around the shadows. There’s some interesting plot development here. There are also a few laughs among the spells, as the comic only stays on the serious side so long before it throws in a few drinking gags to lighten up the mood. After a career of graphic design, art direction and copywriting, I still have a passion for words and pictures. I love it when a comic book comes together; the story is tight, and the drawings lead me forward. Art with words... the toughest storytelling technique to get right. Was this comic book worth your money? Let's see! !